Warwick Academy’s graduating class of 2015 has achieved “outstanding overall results” in the International Baccalaureate Programme, with Fiona Dobson [pictured] ranking as the first student from the school to achieve 45 out of a possible 45 points – an achievement that only 0.3 percent of the programme’s body worldwide can claim. 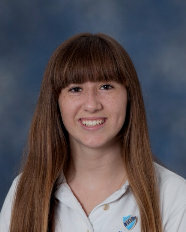 Principal Mrs. Maggie McCorkell said, “Fiona also becomes our second student to achieve direct entry into undergraduate study at Cambridge University. The graduating class achieved a 92 percent diploma pass rate and a 100 percent pass rate in the individual subjects. “In addition, the school’s average diploma score is 32.88 points per student, our best to date. With the worldwide average placed at 30 points, this is a very valid measure with which to benchmark the strength of the programme at the school and it is inclusive of all students not only those at the top end. “There were some outstanding individual scores, with Fiona Dobson on 45 points, Olivia Moore with 42 points, Phoebe Dill with 41 points, Daniel Hetzel with 40 points, Amelia Oatley, and Brianna Siddle on 37 points, and Evan Watkins and Kyra Dunstan on 36 points. “These excellent results are the culmination of commitment, hard work, time management and effort by both the students and their teachers and on behalf of Warwick Academy; I would like to congratulate all involved. “I am delighted with these results and wish all the graduates’ success in all their future educational and life paths,” Mrs. McCorkell added. Congratulations are due to the following individuals. Very good, but do you need to repeat it like we didnt get it the first time. Congratulations are due to all of the students. Whilst special recognition might go to the high achievers, recognition must go to everyone since I am sure they each made their own sacrifice to achieve their results. I am sure there are some students who will be honest with themselves and admit they did not sacrifice as much as they should. Deferred gratification pays off and has no regrets!! Amazing results! Well done and congrats to Warwick Academy! Brilliant, Fiona, very well done! Congratulations to the exceptional students, their teachers and the school!